Earlier this month I hosted a high-level meeting between representatives of the Preston Park Train Campaign and GTR to urge the train operator to tackle the ongoing rail hell that users of this station in particular continue to face because of cuts to services. In the space of just five days, the campaigners had helped to get 1,098 people to sign a petition demanding services be restored – which I formally presented to the House of Commons. The Government is now well aware of the situation on Brighton’s railways, as I used the opportunity of a question at Prime Ministers Questions to again raise the misery of local passengers, particularly those at Preston Park. Last week I secured a debate on the commuter chaos in Parliament, where I questioned Rail Minister Jo Johnson directly. I am in touch with GTR on a daily basis, pressing them to take action over the messages of despair from constituents who’ve contacted me at their wits’ end. I am pushing for the reinstatement of Gatwick Express services, for all trains to have enough capacity to allow Preston Park passengers to board and for fair compensation. I will not let this drop until commuters can rely on safe, regular trains from Preston Park and on the rest of the Brighton Mainline. Working closely with organisations such as Global Justice Now and the Trade Justice Movement, I tabled an amendment to the Trade Bill – New Clause 3 – that would ensure all new free trade agreements are subject to proper parliamentary scrutiny and approval. The amendment was signed by more than 50 Labour, SNP, Liberal Democrat and Plaid Cymru MPs, but unfortunately was narrowly defeated by 314 votes to 284. You can read my speech in support of New Clause 3 here. I backed an amendment to the Customs Bill that would have kept the UK in the Single Market – vital to protecting jobs and the economy – and tabled my own amendment that would have forced the Government to uphold our standards on the environment, food safety and animal welfare. After the Electoral Commission fined Vote Leave and Leave.EU for breaching spending limits during the EU referendum and reported key staffers to the police, I called out the Government’s obscenely complacent response in Parliament. I asked Parliamentary Secretary Chloe Smith to lift the pitifully low cap on fines for breaching electoral law and force campaigns to declare their expenditure online in real time to stop them overspending. I also stressed the need for a digital bill of rights so that we can clear up the data harvesting that has been taking place on an industrial scale by organisations like Facebook. As the blistering heatwave rolled on for another week – with temperatures reaching record highs on Wednesday – the Environmental Audit Committee, of which I’m a member, released a report calling on the Government to take action to ensure infrastructure is far more resilient to heat. I warned of the dangers of extreme weather becoming the new normal and emphasised the urgent need for ministers to do more to tackle climate change to reduce harm from future heatwaves in a piece for the Metro. 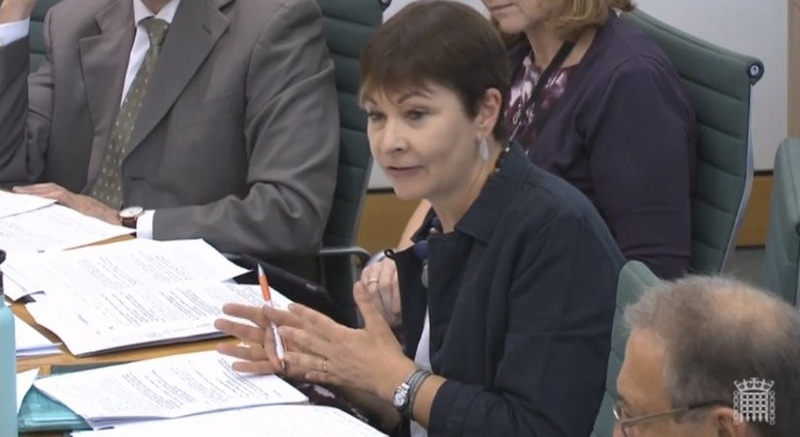 Earlier this month I had the opportunity to go head to head with the Environment Secretary Michael Gove about his plans for an Environmental Governance Bill – designed to scrutinise the Government’s work to protect our environment – during a session at the Environmental Audit Committee. I asked him how he plans to introduce the Bill quickly enough to make sure that – if we crash out of the EU with no Brexit deal – we would still have access to ongoing environmental protections and, crucially, to enforcement mechanisms. Mr Gove must act to avoid a so-called ‘governance gap’ – a period of time when we’ll have lost EU protections but haven’t had time to create our own. I also raised the issue of educating future generations about nature and have secured a meeting with him about the campaign for a Natural History GCSE. I visited Westdene Primary School, who were holding an event to celebrate the opening of their new outdoor learning space. Their PTA has been fundraising for more than two years, so it was great to have the opportunity to meet those who've made it happen, and to hear about the plans to use the space to inspire pupils in a creative and different learning environment. There was brilliant news for schools this month as Brighton Energy Co-operative was approved as one of three solar installers for Brighton and Hove schools. There are about 50 schools that could benefit from free solar and they have to opt in, so if you know a local school that would love to harness the power of the sun, please share the news. In a disgraceful move, the Government tried to bury the fact that it quietly granted permission for fracking in Lancashire on a busy last day before recess. 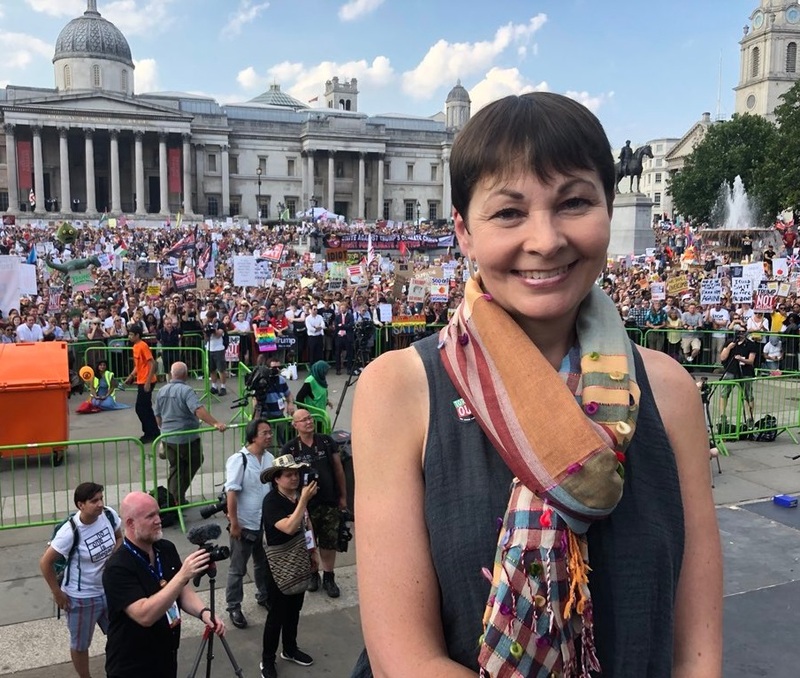 Ministers ignored local people, overruled local councillors and tore up our commitments to tackle climate change for the sake of a dying fossil fuel industry. I didn’t let them get away with sweeping this under the carpet and spoke out in Parliament. The fight against fracking isn't over: I’ll be just one of thousands who keep fighting for clean, safe, renewable energy. Last month I visited the Hollingdean Waste Transfer Station which is operated by Veolia. As concern about plastics polluting our oceans grows, residents in the city often ask why it isn't possible to recycle a greater variety of plastics in Brighton – a frustration I share. Green councillors are pushing the administration to renegotiate the contract it has with Veolia to get a better deal for the city, including an increase in the plastics recycled. The visit was an opportunity for me to put questions directly to Veolia, and I intend to go back to Brighton and Hove City Council to stress the need to look again at this contract. Most days I receive messages from constituents about missed refuse and recycling collections, or other problems linked to the Council's City Clean services. I'm concerned that service pressure issues still haven’t been fully resolved after months of disruption – so I am continuing to raise the problems on behalf of my constituents with Brighton and Hove City Council, including the difficulty residents say they have getting through to City Clean to report problems over the phone. There was a packed audience for a debate on a People’s Vote on Brexit at Central Hall – despite it clashing with England vs Croatia. We paused the positive and productive discussion for the match, and – though it was crushing to see England miss out on a spot in the World Cup final – I got a valuable lesson in defence and the off-side rule from the many football experts in attendance. I intervened in a debate hosted by Jess Phillips MP on the crisis in our family courts, calling for legal aid to be restored in all family cases. This would stop the abhorrent practice of domestic violence survivors being interrogated by their abusers in court simply because they can’t afford lawyers. For several months now I’ve been a member of the Steering Group developing Parliament’s new Independent Complaints and Grievance Policy – which has now been adopted. I’ve been pushing for Parliament to show real leadership when it comes to culture change in Westminster and protecting everyone from bullying, harassment and sexual harassment. The new policy represents a significant and positive step forward, especially in terms of signalling to perpetrators that they will be held to account in future. On some issues however, such as MPs’ roles in final decision making about serious complaints involving colleagues, there’s still more work to be done. I will be keeping up the pressure for Parliament to set an example. I wrote a piece for the Guardian setting out how far we’ve come, and how far we still have to go to make Parliament a better place to work. I was invited to speak at the Stop Trump rally in London and it was great to see so many Brighton people there too. I spoke about his misogyny, racism and climate vandalism. I also wrote a number of comment pieces in the run up to his visit to the UK, including this and this. I was so sorry to miss Brighton’s Trans Pride this year – I was invited to the Isle of Wight where they were hosting UK Pride. I used that opportunity to stress the importance of solidarity with the Trans community. The “Nothing About Us Without Us” message behind Trans Pride this year was especially important and I look forward to continuing to work locally for Trans voices to be heard. This week I spoke in Parliament about Yarl’s Wood detention centre – where the Home Office locks up hundreds of women without telling them when they’ll be free. When I visited Yarl’s Wood a few weeks ago, I got a real sense of the mental torture these women are going through. I called on the Home Secretary Sajid Javid to end all immigration detention, starting with a 28-day limit. This cruel practice makes vulnerable people more vulnerable and it simply does not work. On 12 July I hosted an important and fascinating roundtable in Parliament with Sussex University on their research on improving how refugees are resettled in the UK. It was great to hear experiences directly from refugees, and to compare the situation for new arrivals in Brighton with that in Norwich with Clive Lewis MP. protect the NHS from global trade. 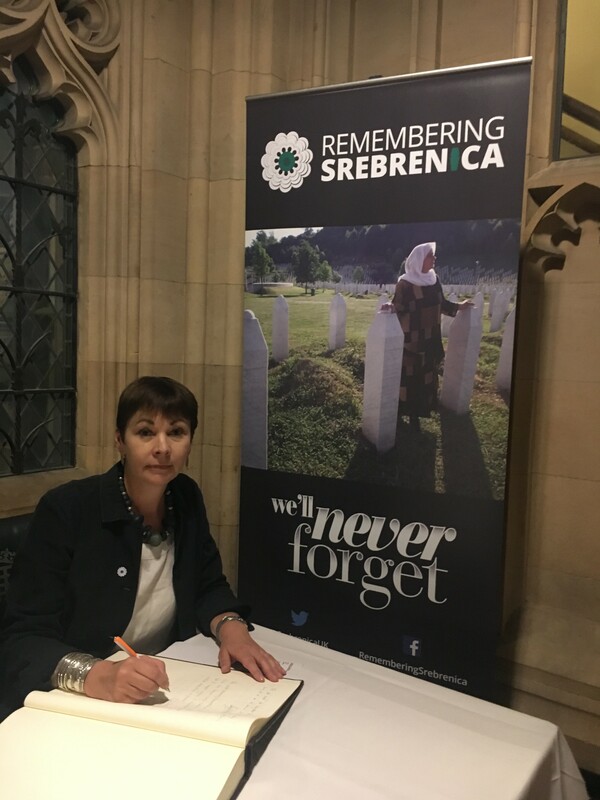 To mark Srebrenica Memorial Day, I honoured those who were murdered during the genocide 23 years ago by signing the Remembering Srebrenica Book of Pledges. I promised to stand up to hatred and intolerance and promote a fair, equal and cohesive society for everyone. Srebrenica Memorial Day reminds us all that a shocking genocide took place in our lifetime and this should never be forgotten. I strongly encourage everyone to take this day as an opportunity to remember the victims and survivors of Srebrenica, but also to work together to make our own community a place that welcomes and cherishes diversity. I hosted a roundtable event in Parliament to mark the launch of a new edition of Commander Robert Green’s book, Security without Nuclear Deterrence. It was an inspiring conversation about how we can build a safer world without the awful spectre of nuclear weapons.